If you've ever plugged your guitar straight into a Vox AC30 in the hope of eliciting the brand of smooth, compressed distortion Queen guitarist Brian May coaxed from these amps, you've probably been rudely surprised. While a Vox AC30 can produce many magical tones, it doesn't approach the level of saturation that gives classic Queen tracks their royal oomph. As it turns out, to make his Voxes sound like champions, May used a secret weapon: a treble booster. One the first two Queen albums, the guitarist's device of choice was a Dallas Rangemaster, and subsequently he had effects guru Pete Cornish build him a custom unit that produced less noise, more gain and a warmer sound. 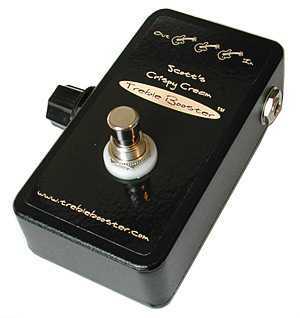 To capture the sonic spirit of this second device, Scott Humphrey created the Crispy Cream Treble Booster Model 2 ($199.00), a true bypass stomp box designed to pummel the input section of a nonmaster volume amp into tuneful submission. Featuring a single volume control (which doubles as an on/off switch), hand-built construction and point-to-point wiring, this pedal is virtually idiot-proof. It delivers a loud and clear signal (fuzz freaks take note: this is not a distortion pedal, just a clean boost) that facilitates fluid single-note runs and beefy chords without adding any harsh highs to your top or turning your bass response into a sloppy mud slide. And while the pedal shined though a Vox AC30 Top Boost reissue, it fared equally well when faced with a mid-Seventies Marshall Super Lead and a tweed Fender Deluxe. Crispy? Not really. Creamy? Indeed.